We have video of the attack on the U.S. embassy in Cairo, Egypt, on Tuesday, September 11, 2012. In the clip, the Islamists remove the American flag and raise the black flag of Islam in its place. They also call for the release of the blind sheikh, Omar Abdel Rahman. He is in U.S. prison for his role in the 1993 attack on the World Trade Center in New York. Full video here. A film prompted the violent anti-American protests (trailer below). Israeli filmmaker Sam Bacile, a California resident who is now reportedly in hiding, posted a trailer of his film, “Innocence of Muslims,” to YouTube on July 2. In the trailer, Muhammad is depicted seducing a married woman and a young girl, in each scene inventing Quran passages to justify his sexual desires. 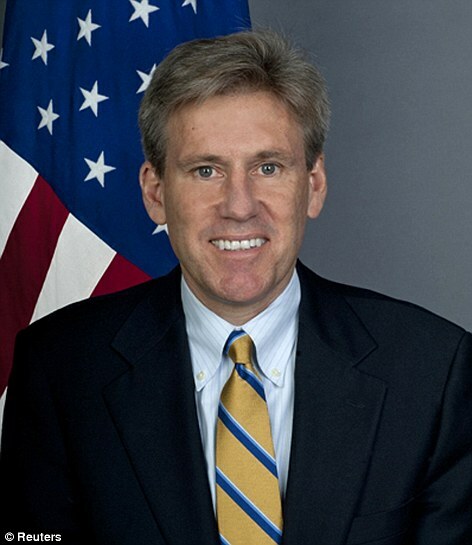 In Libya, terrorists murdered the U.S. ambassador to that country, Chris Stevens, in a Tuesday evening attack. Three other embassy employees were killed. Stevens was fleeing the U.S. consulate in Benghazi, which had been overrun by protesters shooting machine guns.